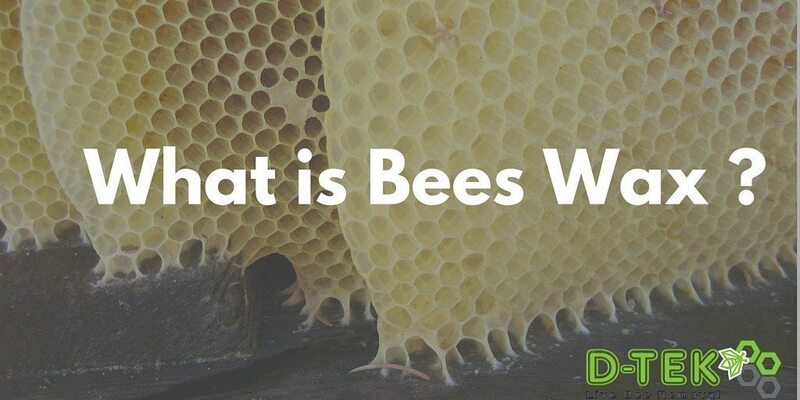 What is Bees Wax ? What is bees wax and why is it so important ? Bees wax is a natural wax produced by bees and it is the main component of the honeycomb built by bees. Typically when bees are removed from the comb (or they leave one behind) the whole honeycomb is melted and then filtered to get rid of all bee residue. The melted wax is then saved, poured into molds and then marketed and sold as commercial beeswax that is used in everything from food glazes, to candles to skin care products. Bees wax is primarily made by younger bees – bees 17 days or younger. The reason for this is that the wax is produced from a gland in the bees that becomes smaller and less functional as the bee ages. Bees wax is composed of at least 284 chemical compounds ! Bees wax is secreted from the abdomen of the bees as tiny flakes that the bees then use in building and patching up the honeycomb. Bees wax is insoluble in water but soluble in organic solvents like chloroform. Beeswax is edible however it cannot be properly digested by the human digestive system and so its’ actual nutritional value is not much. Beeswax candles are better for your home as compared to candles made from synthetic wax/paraffin which tend to release toxic gases into the air. Beeswax was used in ancient dental medicine as a filling. How interesting is that ? Honeybees are truly amazing creatures that contribute immense benefits to the environment and produce several useful products for human use. This is exactly why our company is focused on removing them live from properties and relocating them to bee farmers in the Greater San Diego area. DTEK Live Bee Removal will soon be offering 100% natural bees wax for sale in our online shop. Watch out for it !